While large parts of the world have been changed and developed by mankind, South America is still seen as one of the last locations on Earth where people can see landscapes and scenery as they were many centuries ago. Home to tropical rainforests, astonishing beaches, and countless species of animals, South American nations have proven to be immensely popular with adventurous tourists and backpackers looking to embrace nature in a way that other countries simply can't offer. If you’re planning a South American vacation, you have a lot of different destinations to choose between, with each nation offering its own unique landmarks and advantages. Ecuador is one of the smaller South African countries but enjoys some of the very best weather anywhere in the continent due to its proximity to the equator. The country has borders with Peru and Colombia, as well as a lengthy coastline looking out onto the Pacific Ocean. Many little fishing towns can be found along the coast of Ecuador, with some built-up touristic resort areas as well. Many of these beaches are relatively untouched and unspoiled, offering must-see views and all kinds of exciting activities like surfing, fishing, swimming, and more. If you're searching for some of the best beaches on the Ecuador coast, this beach guide will be able to help you out. We've taken a look at many different beaches up and down the South American nation in order to narrow this list down to the very best locations. No matter whether you're looking for a good water sport beach big waves and lots of activity or a calmer spot for families and kids to have fun together, you'll find all you need in the beach descriptions down below. One of the most popular beaches in Ecuador with both tourists and locals, Crucita was once a very small fishing village but has seen a lot of development in recent years due to rising tourism in the area. Lots of different rental services and outdoor operators can be found at this Ecuador beach offering water sports and other activities. The beaches seem to go on and on at Crucita, so even though this is a touristic area, you can still find plenty of peaceful spots of sand to sit down and soak up some sun. If you're looking for the best surfing beaches in Ecuador, Canoa might be your best option. Located in quite a central location along the country's coastline, this beach sees some big waves and choppy waters, so it's just right for surfers to head out and test their skills against the ocean. Canoa is a long beach lined with cliffs and rocky areas that can be fun to climb and explore, and this beach doesn't attract the same loud crowds and high numbers of tourists as some of the others. Tonsupa is found in the Esmeraldas Province, which is generally regarded as one of the best areas for beaches in Ecuador. Of all the Esmeraldas beaches, Tonsupa is one of the prettiest. Locals living in the Ecuadorian capital city of Quito often visit this beach at the weekends or on special occasions, and various hotels and resorts can be found right nearby. Colorful beach umbrellas are spread out along the sand, offering welcome spots of shade on sunny days, and other amenities at this beach include several public restrooms, sun loungers, and local eateries. 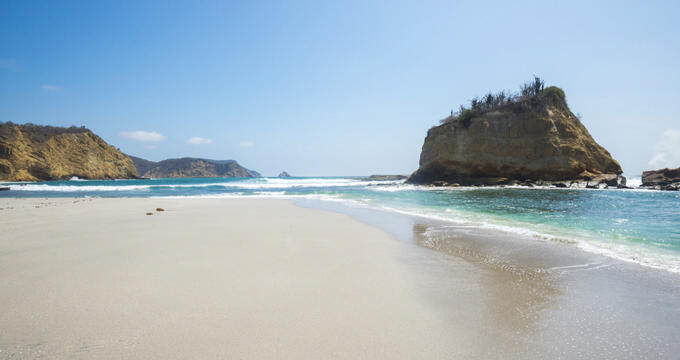 Located in the Machalilla National Park, Los Frailes is one of the best-known beaches in Ecuador and is conveniently located for people living or staying in the city of Guayaquil. This is a simply gorgeous beach with sugary sands and imposing cliffs lining the far end, but there are some strict rules here due to the national park status of the beach and surrounding area. Park rangers will be standing by to ensure that visitors don't bring in any prohibited items that could ruin the pristine beauty of the beach, but they tend to be a little more lenient during the main touristic season. A breathtaking beach, Montañita is one of the best places to sit and watch the sunset not just in Ecuador, but in all of South America. The sky really lights up with a stunning spectrum of reds, golds, and yellows as the sun goes down over the waves on the horizon, making Montañita a very romantic spot for couples. In the daytime, the beach is a little busier with lots of music being played at the local bars, creating a lively party atmosphere in the afternoons. Lots of food vendors are located here too, offering low-priced snacks and drinks to enhance your lazy beach days. This beach, like Tonsupa, is found in the Esmeraldas province not far from the city of Esmeraldas itself. Mompiche is actually the name of a small fishing town, but it has over four miles of sunny, sandy beachfront for locals and travelers to enjoy. With all that space, you never have to worry about the crowds at this Ecuador beach, and even on the busiest days of the year, you can simply walk a little further along the coast and find a nice quiet spot. This is a nice beach to sit and admire the sunset, and you might even be able to soak up some of the local culture as you watch the native fishermen casting their lines out to sea.